The prophet Elijah (1 Kings 16:29 to 2 Kings 2:18) practiced his ministry in Israel during the reigns of King Ahab (874-853 BC) and his son King Abaziah (853-852 BC). The setting to the story began when Ahab married the pagan princess Jezebel and erected an altar and a sacred pole to Baal in Samaria. Baal was the Sun-God of the Phoenicians and the Sacred Pole was used to chart Baal's journey through the twelve signs of the zodiac. By embracing the religion of a "false God," Ahab did more to anger "the Lord" than any of the kings of Israel before him. The prophet Elijah (Elias) the Tishbite then delivered a message from God to King Ahab that God would bring a drought to his kingdom. The significance of this message was that Baal was worshipped for his supposed power over the sky and the weather, so God's message was a direct challenge to Baal and a sign of God's displeasure to the king. Elijah then departed to the Kerith Ravine, east of the Jordan river, where ravens brought him bread and meat. When the drought dried up the stream, God sent him to live with a widow where he remained for over two years as the drought intensified. During this time, Elijah multiplied the widow's jar of flour and jug of oil so that they never ran out. The widow's son then died from an illness and Elijah raised him back to life. (1 Kings 17:7-24). Mark took note of these two miracles and had Jesus perform even greater ones. In the third year of the drought, God sent Elijah back to King Ahab where Elias challenged 450 prophets of Baal and 400 prophets of Asherah to a contest to see whose God could send down fire from heaven to consume a sacrificed bull. The false prophets prayed to Baal but their god was unable to start a fire. Elijah then built an altar of twelve stones to symbolize the twelve tribes of Israel. He then had 4 jars filled with water which were poured over the wood and the cut-up bull three times. Elijah then called on God to send down fire on the water soaked offering. God then sent down fire to Elijah's altar to consume the offering and win the contest. The people then killed the prophets of Baal and abandoned their idolatry. God in turn immediately ended the drought by bringing a great rainstorm (1 Kings 18:1-46). The God of Israel was thus proved to be a God of fire, more powerful than the sun-god Baal. The king's wife Jezebel then ordered Elijah to be killed so he fled into the desert where an angel appeared and brought him food. He then journeyed south 40 days and nights through the desert to mount Horeb in the Sinai peninsula where God appeared to him and sent him north to Damascus to anoint Hazael and Jehu as kings of Syria and Israel and to find and anoint his successor Elisha. During this journey Elijah came across Elisha who was plowing a field with twelve oxen. After sacrificing the animals Elisha became Elijah's disciple (1 Kings 19:1-21). The twelve oxen signified the twelve signs of the zodiac and the death of the pagan age of Taurus, the bull. The next three chapters in 1-Kings recount more incidents over the years in the reigns of Ahab and Jezebel and the prophecies that come to pass about their deaths. Elijah was thus the prototype for John the Baptist in manner and appearance. The king then sent out a company of fifty men to capture Elijah. They found him seated on a hilltop and commanded him to come down. Instead Elijah asked the Lord to send down fire and destroy the men which was done. The king sent another fifty men with the same result. Another fifty were sent out and the captain begged Elijah not to kill them. An angel of the Lord said the captain could be trusted so Elijah went down and ordered the captain to deliver the same death message to the king. The fifty men returned and the king died in fulfillment of the prophecy. The God of Israel was thus again proved to be a God of fire, more powerful than the sun-god Baal. The second chapter of 2 Kings abruptly announces that the Lord intends to take Elijah up to heaven in a whirlwind. As Elijah and Elisha begin their eastward journey from Gilgal to the Jordan River, scores of guild prophets come out from Bethel and Jerico to ask Elisha if he knows that the Lord will take up his master that day. Elisha says, "Yes I know it. Keep still." The gospel of Mark would copy this messianic secrecy theme when Jesus commanded unclean spirits not to reveal his true nature to the people. When the two prophets finally reached the Jordan river, which was known as the river of the rising sun, fifty prophets were watching at a distance as Elijah rolled up his mantle and struck the water of the river. The water was parted and the two prophets crossed over to the eastern shore on dry ground. After they both crossed over, Elijah revealed he was to be taken away and asked Elisha what he could do for him. Elisha asked for a double portion of Elijah's spirit. Mark would invoke the "double portion of Elijahs spirit" when he was dying on the cross and the bystanders mentioned two times that he was calling for Elijah. 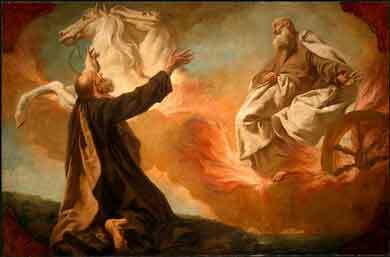 A fiery chariot and flaming horses then came between them and took Elijah up to heaven in a whirlwind. A fiery chariot was a well known metaphor for the sun. Elijah now became the only Old Testament prophet who did not die, was raised up to heaven, and the raising happened through the action of the sun. Mark used this theme of being raised by the sun when the three woman who came to his tomb at sunrise found the stone rolled away and a mysterious youth waiting for them who told them that Jesus had been raised. When Elisha could no longer see Elijah he tore his own garment in two. Mark copied this theme when the temple curtain was torn in two just before he died. Elisha then picked up Elijah's mantel which had fallen from him and all of Elijah's power was now transferred to Elisha through his master's mantel. Mark used this theme of garments having power like when a woman who had a hemorrhage for twelve years was cured by just touching the hem of his garment and like when his garments shone like the sun when he was transfigured. Elias Raised up by "The Sun"
The above graphic is probably the most surprising example that I have ever seen of how a gematria diagram can mirror a bible story. The Greek name for Elijah is Hay-lee'-as (`hliaV) and his gematria value is 249 units. The Greek word for the Sun is Ho Hay-lee-os (o hlioV) and has a gematria value of 388 units. Helias (249) and Helios (388) are represented as circles with diameters equal to the number of their names. The diagram shows the sun coming down from heaven where it becomes tangent to Elias and then the sun raises him up to the top of the graph. The mathematical accuracy is 99.98% ... a perfect fit! Even the Greek pronunciation of their names (Hay-lee-as and Hay-lee-os) is almost identical.